See that URL? Copy-paste it & extract “key” from there, this will be required for programmatic access to your spreadsheet. Google API does not support pure JSON, so in order to parse it using standard tools you need to strip extra JSONP overhead from the response. I am adapting this function for use in my WordPress plugin, WP-SortTable (coming soon), and will credit you in the code and readme.txt. Thanks! glad it helped you! I cannot load the contents of a public Google Spreadsheet (https://docs.google.com/spreadsheet/ccc?key=0Aj-ZlsTpsY_wdEhIdTdhYzlmTmdEMXhjVEJaWERtUFE ) no matter what I try. Any thoughts? I wrote this article about a year ago, google APIs may have been changed since that time. 2012-03-29 01:17:06 ERROR 400: Bad Request. I would consider using Gdata library, there should be some demos of working with spreadsheets. 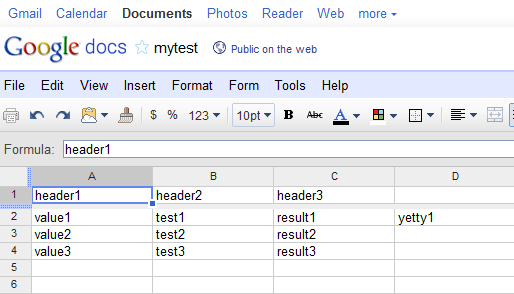 How can i use private google spreadsheet.